We’re doing an art installation in two of the three trains that go from Yerevan to Gyumri, and back. The art installation will stay up from October 29, to Sunday, November 1. Wagon1: “the Nest” an origami installation by Lilit Markosian and HAYP Pop Up Gallery. Wagon1 and Wagon3 are located in train A.
Wagon3 is located in train B. 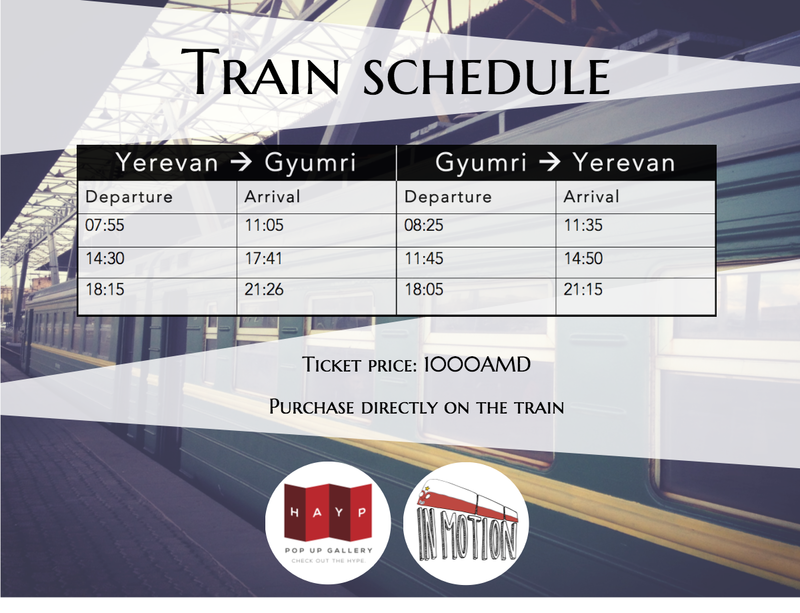 There is no exhibit in train C (which is the early morning train from Gyumri to Yerevan at 08:25, and the late night train from Yerevan to Gyumri at 18:05). Theater, contemporary dance, acoustic guitar, accordeon, latin american folk music… For detailed program, click here. Where to stay in Gyumri? The train schedule stays the same as usual… and the price too! The train leaves from the main station in Gyumri, and the Sasuntsi Davit station in Yerevan. BE CAREFUL! The train leaves right on time. We recommend coming to the platform at least 15 minutes before!